With the 2014–15 basketball season coming to a close, freshman guard Tadric Jackson is finally getting a chance to make an impact. In his last five games, he is averaging 8.6 points, 3.6 rebounds and 2.0 assists per game. Jackson, a cousin of teammate and sophomore Chris Bolden, was highly recruited out of high school, ranking as high as 78th in the nation and third in Georgia. Last year, he led Tift County High School to a class 6A state title and was named all-class Player of the Year in the state of Georgia. As a senior, Jackson was called a complete player, averaging 18.9 points per game while also managing 3.6 assists per game and contributing greatly on defense. Although he’s from Tifton, about three hours south of Atlanta, his transition to life as a Tech student-athlete has gone smoothly. Due to the suspension of Bolden, Jackson had his first start on Feb. 16 against the Clemson Tigers and has started every game since then. Jackson began his first season at Tech with a very inconsistent role on the team. He showed his potential early on in the year, as he scored 17 points in 17 minutes against Marquette last November. However, he has struggled shooting throughout the year and has only made 26.3 percent of his shots. The struggles have also come from the three point line, as he is currently shooting just 16.5 percent from beyond the arc. Despite this, he and his teammates believe that his situation will improve down the stretch. Even some of the best high school stars can have a difficult transition the college game. Jackson has shown that he has confidence in himself as he never turns down an open look. He leads the team in three point attempts, despite having the lowest three point percentage in the ACC. Jackson feels that some of his woes can be attributed to bad luck, and he is hoping for regression back to his mean. Jackson has seen more consistent playing time since the game against Duke early in February, averaging around 23 minutes in the last eight games. 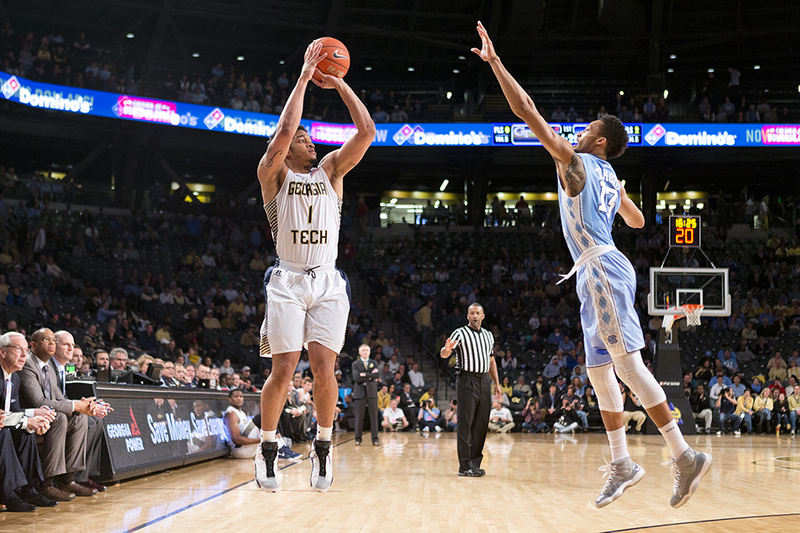 He played a career high 34 minutes in Tech’s last home game of the season against North Carolina. The game against the Tar Heels saw everyone on the Jackets play more minutes than usual due to the injury of junior Marcus Georges-Hunt. However, Jackson believes that his increased playing time has been beneficial to his ability on the court. The highlight of Jackson’s spring was a monster dunk over Louisville’s Chinanu Onuaku back on Feb. 23, which was impressive enough to take the No. 1 spot on SportsCenter’s Top 10 the next morning. It was a prime example of the intensity he can bring to this team. According to head coach Brian Gregory, Jackson’s attitude and work ethic in practice have led to his increased playing time. Jackson has seen a major increase in usage in the final few games of the season. Tech fans should expect to see a lot more of Jackson in the seasons to come.